self pickup from our warehouse is only available by appointment. Please call 61002823 our office line for enquiries. Fast delivery. Have not open yet so do not about the smell or the taste. Will try soon. One of its uses is for adding to rolled oats for baking crispy, fragrant granola. It's healthier than butter. Delivered all fine. Yet to try! Hassle free collection. Taste good. Ordered Mar 24. Collected on Mar 27. Second purchase. Worth the amt with the price! The item came as mentioned. Very great product. Will definitely purchase again. This 500ml coconut oil, can I just consume? Yes, you can consume it directly or use for cooking. It's suitable for skin care and hair care too. What is the expiry date of coconut oil? This one bottle is 1000 cc for $19.00, *unrefined organic coconut oil eatable? To pick up be at address be ok? then how much be the two bottle of 1000 cc for how long take and altogether how much S$? Hi, we had already answered your queries via email. Just to clarify, we do not have 1000cc. it should be 1000ml which is 2x 500ml bottle. Thank you. There is no option for self collection, could you please allow for self collection? Thanks. Yes self collection option set. Thanks. I had order 2 qty of 2 X 500ml (total 4 bottles of 500ml) Organic Extra Virgin Coconut Oil but only received 2 bottles of 500ml oil today. Please check and send me the balance 2 bottles asap. Dear customer, we will arrange to deliver the balance to you. sorry for the inconvenience caused. I would to consume this directly, what's the best time & how much should I take? 100% Castor Oil 473ml. Lowest price. Carrier oil Value pack. Coconut oil. 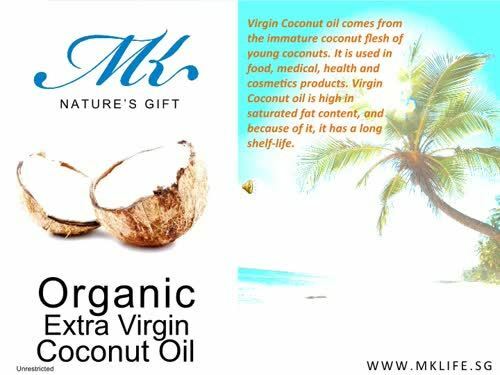 100% organic virgin coconut oil 414ml/bot. Food grade. Moisturising.